Just the day before there was this daily dog walk. I was walking past the M.E. DePalma Park and there was a small stand of Mexican Milkweed. This seems to be the time of year in South Florida that the native species are all going to seed. That is a good thing, time to drop seed so that they are going to grow more next year. I may be wrong, it just seemed to me that a lot of the "Natives" there had tufts of fluff and were leaving seeds all over the place. One of the seed pods of the Mexican Milkweed had burst open and the breezes had begun to scatter the seeds. I took a sample of the seeds and became Johnny Appleseed. Blowing into the tufts in my hand the breezes took the seeds and blew them down the block to hopefully find a place not grassed over and wild enough to grow. Yesterday morning, walking around my yard I noticed that the caterpillars were all over the place trying to find a bit of sun to warm their little bodies. Unfortunately the little bit of green you see above is about all that was left on each stick. I plant the Milkweed in my yard because I like having the Butterflies here. Many times, I will look out the window and a Black and Orange beauty floats by. 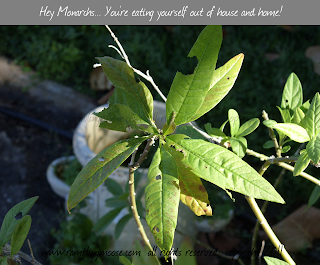 Unfortunately for them, they tend to lay their eggs all over my two pots of Milkweeds. The plants have all their leaves eaten then the caterpillars are pretty much done for. I've never seen them eat anything else. The pot that I took this picture from had so many caterpillars on the plant that I gave up counting. I'd say that Johnny Milkweedseed has a bit of work to do. Dear Johnny Milkweed Seed - Blow - Blow - BLOW!